Mountain Meadows is an award-winning 55+ community in beautiful Ashland, Oregon. This community has won numerous awards national awards and continues to attract interesting and active individuals to Ashland. Thoughtfully designed, the community sits on 27 acres of mature trees, well-maintained landscaping and a year-around stream and pond. Residents of Mountain Meadows enjoy scenic views of Mt. Ashland and the surrounding hills of Ashland but are only minutes away from downtown arts and entertainment. What continues to make the community unique and special? In today’s interview I speak with Linda Doren, Principal Broker for Mountain Meadows Realty, to learn more about the answer to this question. Hi Linda, welcome back and thanks for taking the time to speak with us today. Thank you so much, Shields. It is a pleasure to have the opportunity to talk with you and to talk about the Mountain Meadows Community once again! Over the past few years we have explored and discussed the mission and history of Mountain Meadows. In this interview it would be great to explore and learn more about the people and culture within Mountain Meadows and what really brings it to life. As you know, we have won many awards over the years and some are for the thoughtful design of the homes and condominiums to help with our inevitable aging process. We feel forever young here in Mountain Meadows, and it is great to know that the individual units are designed to help us when we need it. 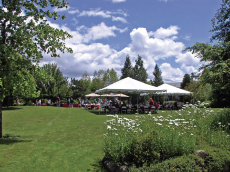 Residents of Mountain Meadows are who bring the community to life. They are the real magic component of this 55+ community. People want to be a part of this vibrant community and experience the friendships; participate in the governance of the community; to stay active both physically and mentally. The life stories of the residents are the true life of the community. I like what you are saying. It sounds like Ashland. 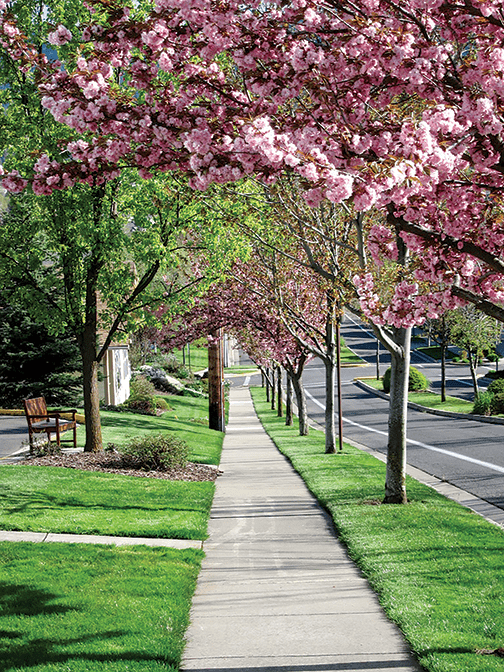 Ashland is a vibrant community and Mountain Meadows is a mirror image. The creative culture and diversity of Ashland are what keep people coming year after year to visit. This same creativity and diversity is in Mountain Meadows Community. The personal creativity and expression drives the residents – involvement in committees, volunteer work in the outside community, cultural events, art displays and classes and the list goes on. Linda, take us behind the day-to-day activities and life within the community. 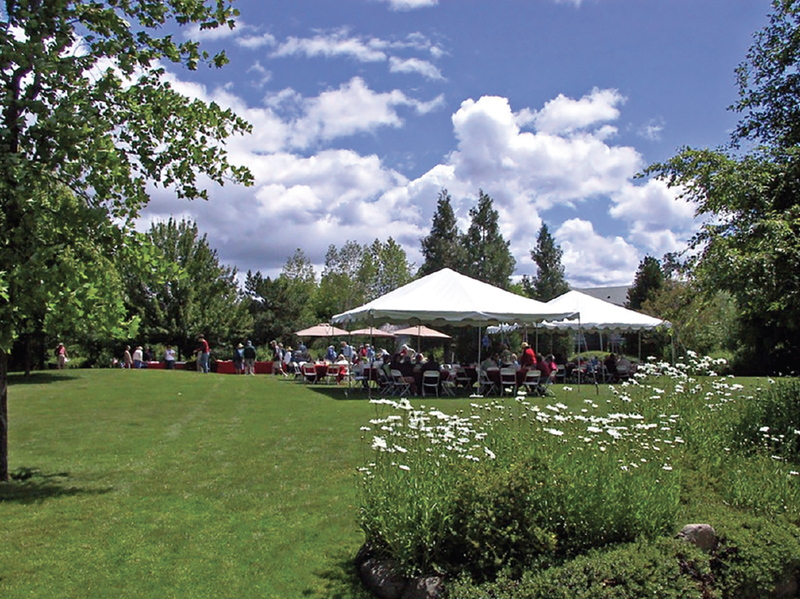 Residents of Mountain Meadows are engaged in the many activities and social events. A typical day might start with coffee in the Fireside Lounge laughing with friends. Perhaps a bit of exercise is next at the state of the art fitness center. Next might be a committee or task force meeting. These groups are what help run the community as it is owned and operated by the residents. Next might be lunch in the Meadowlark Dining Room with friends or maybe a quiet lunch to enjoy the magnificent views of Ashland and the surrounding hills. In the late afternoon or evening there might be Music at the Meadows or Cabaret at the Meadows — excellent music and entertainment by local musicians. For some residents, a bridge game is in order or perhaps takes part in the pool tournament in the game room. For still others, the community garden may be calling their name. There is a great deal going on here. I really see the intentionality that Madeline Hill, founder of Mountain Meadows, had originally planned for, coming to life. Having a sense of belonging, in a community of interesting people who care. Yes — Madeline had a vision and Mountain Meadows has far exceeded her expectations. There are so many times I have seen people move to the community and say they are not social and do not wish to be involved. Within a few months, the community has won them over and they are “refired” not retired. They blossom with newfound friends, new adventures and new life. Mountain Meadows is described as a “55+ community”. Talk more about this. Of course. There are various types of designations for places to live the best years of one’s life. Mountain Meadows is a 55+ community. The only requirement is that one person per household is 55 years of age or older. The ages of our residents are from 55 to almost 100 — actively involved in life in the community and finding purpose and meaning. Mountain Meadows does not offer assisted living? No — assisted living is not offered in Mountain Meadows. We are community, however, where freedom of choice is available to the residents. If additional care is needed, or housekeeper or even a pet walker, residents can arrange for care from some amazing providers of service who operate outside of the community but come to Mountain Meadows. These additional needs are arranged and handled by the resident but they are in charge of scheduling–they are in control. If assisted living is required, there are many facilities in the valley and there is Skylark Assisted Living next door to us. You are continually talking about freedom of choice in your monthly columns in the LocalsGuide. Can you please say more about this? As I just mentioned, part of the freedom of choice is in the selection of additional care or assistance. There is a great deal more though. It is about living in a community where you decide each day what you want to do not what you have to do. It is about choosing if you want to dine with friends or have your meal delivered to your home. It is about pursuing passions and having the freedom to experience life the way they want to. They can “age in place” but most and best of all — it is the “art of living”. Ashland has always attracted interesting people from all over the world. Where are your residents coming from who choose to live in Mountain Meadows? Why are they choosing the community? Like Ashland, our residents are engaged, dynamic, and motivated individuals who have come from all over the United States and even some from Europe. We have a large map in our clubhouse that is called “Mapping our Roots”. There are colored pins on the map showing where a resident is born and where they moved from or lived the longest. It is truly amazing. Residents come to Mountain Meadows for various reasons. A big attraction is Ashland itself. The sense of community in Ashland is the same and even more so in Mountain Meadows. For some it is the possibility of helping run the community and stay active in this process. For still others, it is the beauty of the location and the 27 acres of the community that draw them. After being involved in the community for almost 16 years, what continues to surprise you the most? I am continually amazed at the vibrancy and passion for life here in the community. I have seen so many people blossom and bloom here; to physically and mentally “refire” and live life fully. It is truly an inspiration. Mountain Meadows is resident owned and operated — please talk more about this. This is one of the most unique and amazing attributes of Mountain Meadows. This community of approximately 280 residents is owned and operated (governed) by the residents. There is no big, insensitive corporation and there are no other locations of Mountain Meadows — only us here in Ashland. There is a Board of Directors with elected resident participants. There are committees and task forces who report to the boards. There is a wonderful on-site management company who works hard to make sure things desired by the boards are carried out. This is a debt-free community! We are strong financially! We enjoy life and life abundantly here! Please talk about the level of involvement that people choose to have when living here. We have talked about this to some degree already but residents choose how much and how often they participate in activities here. For many residents, they have much fuller days then when they were working BUT it is doing what they want to do. 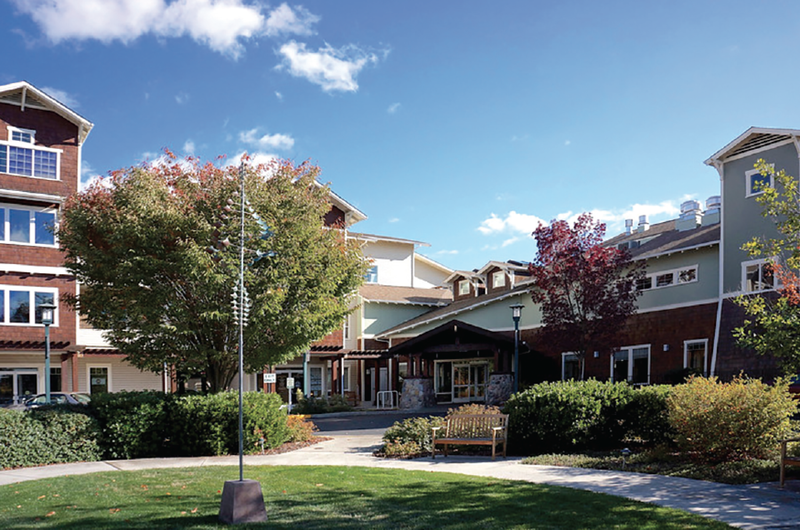 Some residents are involved in many committees and governance of the community while others enjoy the fitness/wellness and variety of classes offered. You are continually inviting the public to events at Mountain Meadows. What events are lined up for this spring and summer? We are still in the planning stages of our upcoming events and have some great things coming in the near future. Watch for announcements! Check the website. Linda, in our culture aging is often looked at as a negative. What are some of your favorite quotes on aging that break the mold and directly relate to the residents of Mountain Meadows? Say more about the idea of Forever Young and Glorious Independent Living. The two statements really speak for themselves. When you are engaged in the community that surrounds you, you feel revived and refired. You may be old in numbers but that is all — you are young in spirit and enthusiasm. The opportunity to live in a community that offers independent living at its best is glorious. The friendships that are made; new relationships that are kindled; the social gatherings and cultural events; the creativity you display that you did not know you had– this is what the Art of Living is about and it is that feeling of being young no matter one’s age. Finally, are there any last thoughts or comments you would like to share with our readers? Implants Prosthetics Inner Guide Expeditions – Get Ready For Your Summer Adventure!